Fujitsu is the leading Japanese information and communication technology (ICT) company, offering a full range of technology products, solutions and services. Approximately 159,000 Fujitsu people support customers in more than 100 countries. We use our experience and the power of ICT to shape the future of society with our customers. In fact we believe the real value our customers get in working with us - whether infrastructure or business solutions, hardware or cloud - stems from our approach. We have a genuine desire to put them at the center of what we do. We don’t subscribe to one size fits all as each customer has specific challenges and needs. This is underpinned by a global portfolio of products and technologies supported by great partnerships. Fujitsu is the world's fifth-largest IT services provider and No.1 in Japan. Innovate without disruption by updating and activating specific business functions on demaFujitsu is part of the Dow Jones Sustainability Indexes (World), FTSE4Good Index Series, and Oekom research. PRIMEFLEX for SAP HANA is backed by 40 years of experience in delivering fast, secure, high availability implementations with optimized TCO, successfully reducing complexity. The pre-defined and pre-tested infrastructure solution is based on SAP certified components and leverages technologies of our specialist partners, such as NetApp, VMware and SUSE. It covers everything, from pre-installed scale-up systems and VMware virtualized platforms as well as individual scale-up and scale-out concepts in line with the SAP HANA Tailored Data Center Integration (TDI) approach right through to customized disaster-tolerant set-ups. PRIMEFLEX for SAP HANA is supplemented by additional services for all project phases; from decision-making and financing up to ongoing operations. The economy is changing faster than ever and businesses have to be agile to stay ahead. This means taking a fresh approach to how operations are resourced. Work equipment, personnel and not least the IT infrastructure has to be very lean and flexible to fit certain business requirements. By leveraging server-virtualization you can replace 15plus servers with a single server. Moreover the integrated and uniform high availability concept increases your application availability. Because new applications can be deployed with a few mouse clicks and you can move applications from one server to another without any interruption of their operation, you achieve maximum flexibility to use your IT resources. 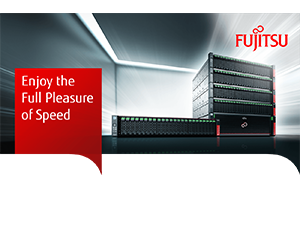 Take advantage of Fujitsu’s PRIMEFLEX portfolio for server virtualization to meet changing business demands.